SPRINGFIELD, Mo. 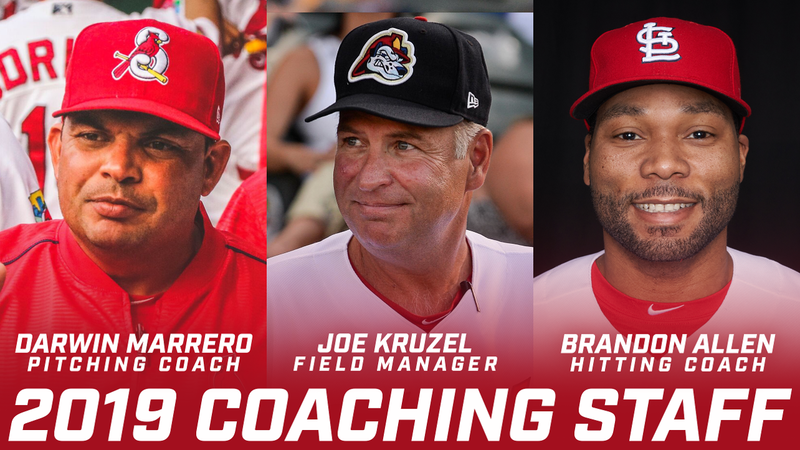 -- The St. Louis Cardinals have announced that Joe Kruzel has been named the new Manager of the Springfield Cardinals for the 2019 season, becoming the sixth skipper in Springfield history. Darwin Marrero will be returning for his second season as the Cardinals Pitching Coach. Brandon Allen has been announced as the Cardinals new Hitting Coach. Dan Martin has been named Springfield's new Trainer and Dan Vega will serve as Strength Coach. Kruzel, 53, enters his 12th season with the Cardinals and seventh year as a manager within the organization, most recently leading the State College Spikes (Short-A) to a 36-40 record in the New York-Penn League. Kruzel made his Spikes debut in 2017 following the ascension of Rodriguez to Springfield. He's had previous managerial stints with Peoria (High-A) in 2014-16 and Johnson City (Rookie) in 2013. Kruzel has led his teams to two postseason appearances as a manager within the Cardinals organization and holds a career managerial record of 363-333, including one season (2007) as a manager of the Billings Mustangs while with the Cincinnati Reds organization. Kruzel's career in professional baseball spans 12 years, starting out with the Reds for two years before moving to the Cardinals as a hitting coach with the Quad City River Bandits (High-A) in 2008, where he remained until being hired as manager in Johnson City in 2013. Prior to his time with the Reds, the veteran collegiate coach served as assistant baseball coach at Miami (Ohio) University in 2005. He also spent 15 seasons (1989-2003) at the University of Toledo, where he served as assistant coach from 1989-92 and then moved on to head coach from 1993-2003. Kruzel was named Mid-American Conference Coach of the Year in 1999. In addition to his coaching career, the Toledo, Ohio native played second base at Toledo from 1985-1988. He currently resides in Hamilton, Ohio, with his wife Amy and three children A.J. (25), Jaime (22) and Abby (20). A.J. was drafted by the Cardinals in the 37th round of the 2013 draft, but did not sign. "We are very excited to welcome Joe into the Springfield community and into the line of excellent managers who have come through Hammons Field, which of course includes current St. Louis Cardinals manager Mike Shildt," Springfield Cardinals Vice President/General Manager Dan Reiter said. "With more than three decades in professional and collegiate baseball, Joe brings unique and valuable experience and perspective to the sport, and we know our fans will enjoy his presence at the stadium. "We're also thrilled to have Darwin back as our Pitching Coach and are very much looking forward to welcoming Brandon as our new Hitting Coach. We do of course want to thank Johnny Rodriguez for his two seasons as our manager, where he was a popular mainstay through the Springfield community." Marrero, 38, is beginning his seventh season in the Cardinals organization and second with Springfield. Twelve pitchers from Marrero's staff received call-ups from Springfield to Memphis (Triple-A) during the 2018 season. Marrero's career with St. Louis began as Pitching Coach for the Gulf Coast League Cardinals (Rookie) from 2013-14, followed by the same role with the State College Spikes (Class-A) from 2015-17. The 2016 Spikes recorded a league-low 1.76 ERA in the New York-Penn League Playoffs on their way to capturing the league championship. Prior to joining the Cardinals system, Marrero was Pitching Coach for the Sioux City Explorers in the American Association (2008). The Explorers staff compiled a league-best ERA, boasted the Pitcher of the Year and their closer established a new league saves record. In 2005, he was Pitching Coach for the Capitales de Quebec in the Can-Am League while also throwing 38 innings as a player. Marrero's playing career spanned seven seasons from 1998-2004 with the Montreal Expos organization, attaining his highest level at Double-A with the Harrisburg Senators in 2002 and 2004. The Conroe, Texas native played professionally for 13 years, including four seasons at the Major League level with Arizona (2009-11), Oakland (2011-12) and Tampa Bay (2012). In 2011, Allen became only the second player in history to homer into the upper deck at the New Yankee Stadium. In 2012, Allen was the Opening Day first baseman for the eventual A.L. West champion Athletics, starting the MLB opener on March 28 in Tokyo against the Mariners. Allen earned a football scholarship to Rice as a linebacker and defensive end and had a baseball scholarship at the University of Houston. He was originally drafted by the White Sox in the fifth round of the 2004 First-Year Player Draft out of Montgomery (Texas) High School. He currently resides in Indiana, Pennsylvania.